Wildfires are ravaging not just California but also other states along the West Coast with Washington being hit especially hard. Officials announced air quality in Seattle had become worse than that of Beijing, China, one of the most polluted cities in the world. Wednesday, the Environmental Protection Agency reported that Seattle's air-quality index was at 171 (unhealthy), while in China the Beijing U.S. Embassy Air Quality Index was at 38 (good). The air quality continued to worsen over the weekend with parts of Washington reaching hazardous levels prompting authorities to warn elderly residents and children to "avoid prolonged or heavy exertion." Sunday, Spokane saw the air quality index reach 301, deep into the "hazardous" range meaning everyone is urged to avoid exerting themselves outdoors. The smoke caused several major sports games at local universities such as Gonzaga and Eastern Washington to be canceled. Some parts of Chelan County saw such hazardous levels that officials distributed masks. The smoke from the wildfires of the West Coast is so thick, it has even reached the East Coast of the United States and beyond. 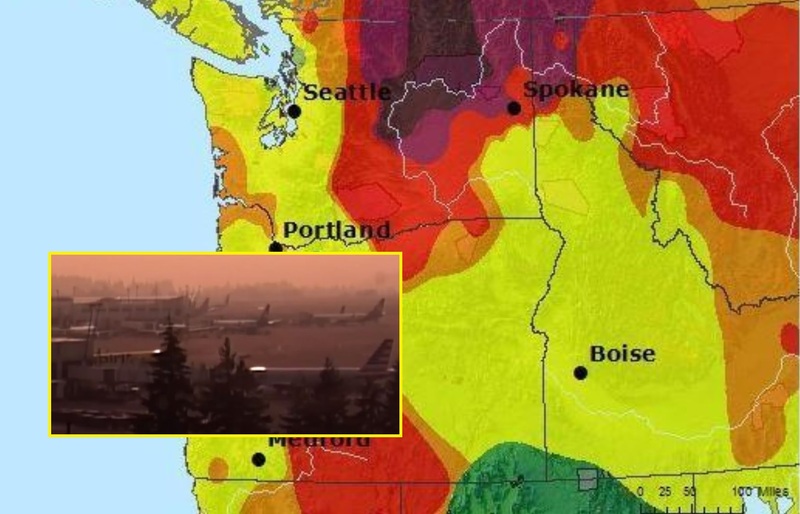 The smoke became so thick Sunday evening that Sea-Tac airport was forced to delay its flights by up to 90 minutes. If all the people died in SF, Portland and Seattle we would be way better off!